for the weekly newsletter and get your free bonus eBook! Overnight Oats are my #1 fuss-free breakfast at the moment. 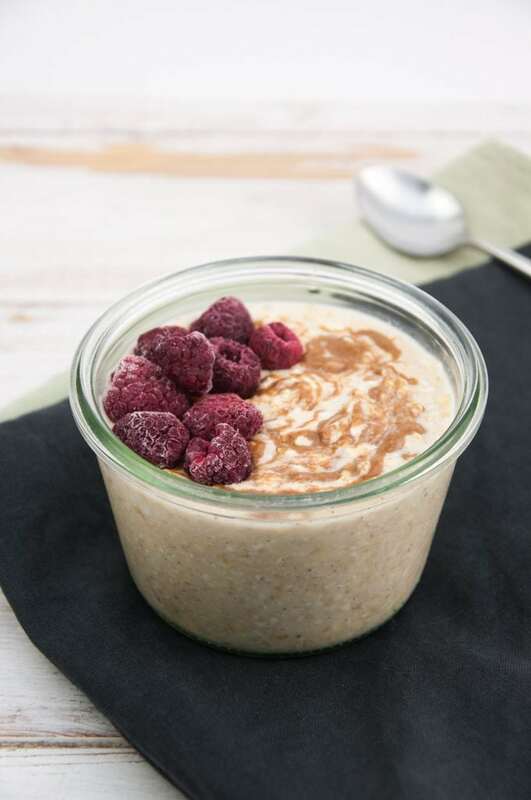 These Simple Vanilla Overnight Oats are topped with almond butter and frozen raspberries. Waking up is so much easier when you know there’s breakfast waiting for you in the fridge. Oats are without a doubt THE breakfast grain! Whether they are used in warm oatmeal, cold overnight oats, oat pancakes, granola – there are so many delicious possibilities to eat oats. My favorite way to eat oats rights now is definitely in overnight oats. 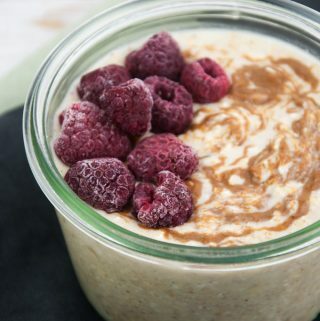 This is a very simple overnight oats recipe with a vanilla base and it’s topped with almond butter and frozen raspberries. If you want to change things up, make sure you also check out my Blueberry Overnight Oats and Chocolate Overnight Oats. Of course, you can add any toppings you like. Peanut butter, cocoa nibs, banana slices, chocolate sprinkles, coconut flakes would be nice too! 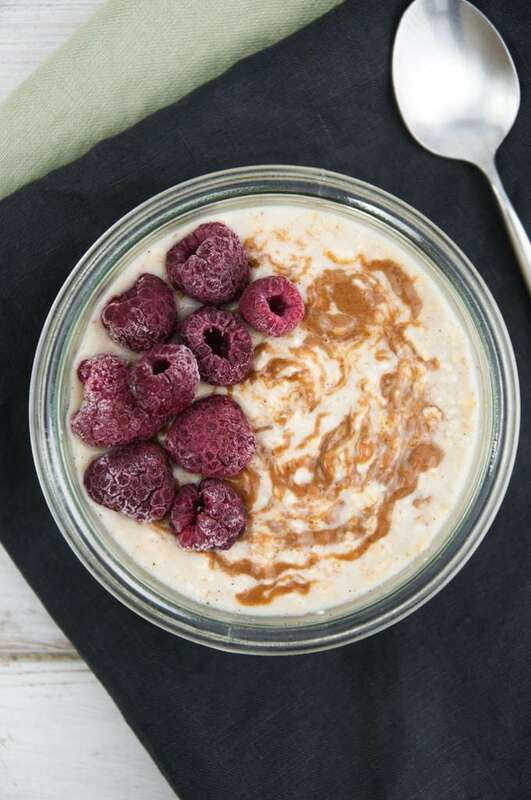 Overnight oats are super easy and quick to prepare. No stove needed. Just mix together the ingredients and the oats will soften in the fridge overnight. In the morning, you’re waking up knowing that a delicious breakfast is already waiting for you. These are the best mornings! Combine plant-based milk with rolled oats in the ratio 1:1 (for this recipe I’ve also added maple syrup and vanilla bean powder). Give it a good mix. Let it thicken in the fridge overnight. The next morning, add a splash of plant-based milk (optional, but I like it more that way!) and give it another stir. If you don’t have a lot of time in the morning, or if you’re eating at school/university/work, this is the perfect breakfast. It’s fuss-free and you can take it to go! Overnight Oats are my #1 fuss-free breakfast at the moment. 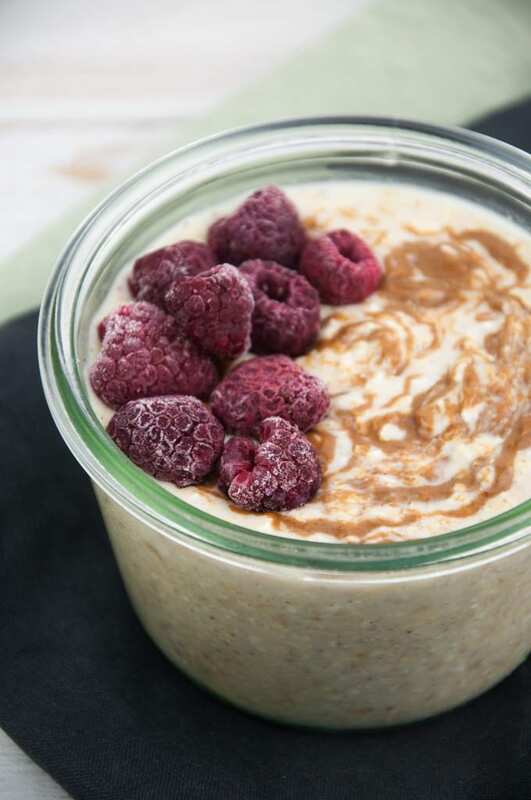 These Simple Vanilla Overnight Oats are topped with almond butter and frozen raspberries. Waking up is so much easier when you know there's breakfast waiting for you in the fridge. In a bowl, combine the rice milk, maple syrup, and vanilla bean powder. Mix. Add the rolled oats and mix again. Fill it into a glass jar and let it sit in the fridge for at least 4 hours (best is overnight - hence the name). The next day, I like to add a tablespoon of rice milk to make the overnight oats more liquidy. Give it a quick stir. Then top it with almond butter and frozen raspberries. Enjoy! * Of course, you can use any plant-based milk you like! 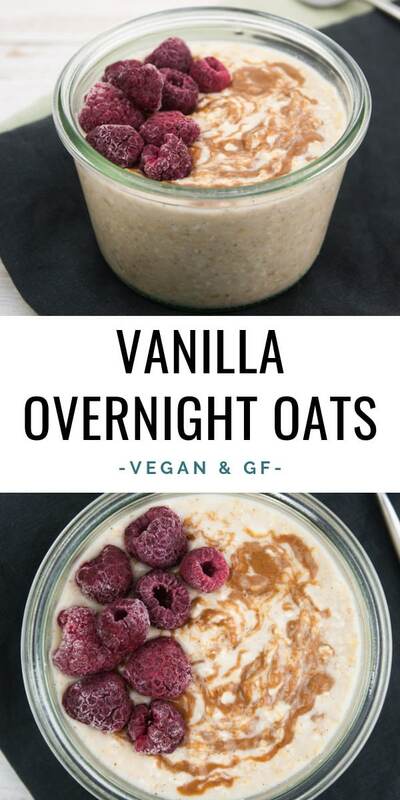 I used stevia-sweetened rice milk for these overnight oats and it was perfect! Hazelnut milk, almond milk or oat milk would be great too! Tried this recipe?Mention @elephantasticvegan or tag #elephantasticvegan! Rate the recipe!A recipe rating helps other users to figure out if they should try a recipe. Please leave a good rating, if you like the recipe! Affiliate Disclosure: This post may contain affiliate links, which means I may earn referral fees if you make a purchase through my link. While clicking these links won't cost you any extra money, they will help me keep this site up and running! Hi, I’m Bianca! When I went vegan in 2012, I fell in love with food all over again. You can find me on Facebook, Twitter, Instagram, Pinterest, and YouTube. Check out my first cookbook: The Veginner’s Cookbook!